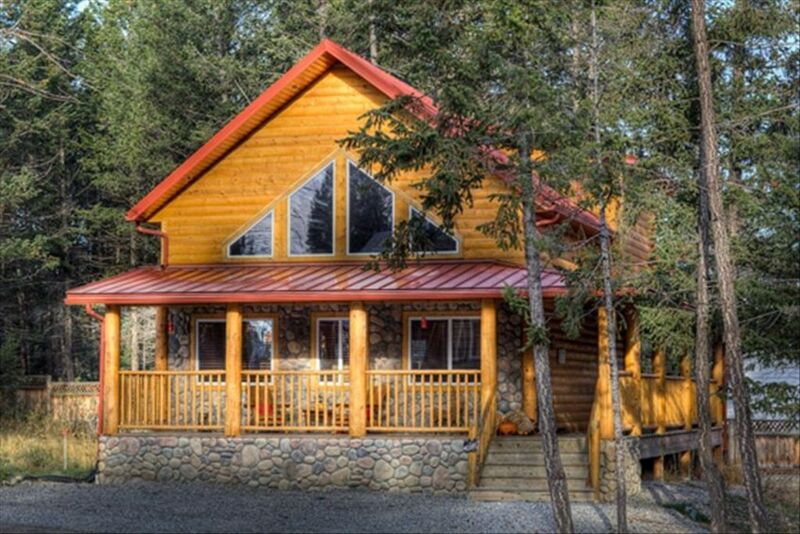 Iron Ring Lodge Chalet is a beautiful, rustic log chalet set in the midst of the Purcell and Canadian Rocky Mountains. Complete with a loft, this 1,750 ft. chalet, sleeps 2-9 guests comfortably. Air conditioned, a large fully stocked kitchen, living room, dining room, family room, reading nook, 2 fireplaces. 3 bedrooms, 2 bathrooms (1 with steam shower). Wraparound deck with BBQ. Perfect for relaxing and entertaining for a couples, friends or family getaway. Technology info: Shaw satellite with HD package installed. Free Wi-Fi and there is an excellent signal for cell phones or Blackberries. PlayStation2, Guitar Hero and Pop Star are very popular with all ages, along with the Nintendo Wii (Fit, Sports). Large variety of games and cards (Monopoly, Scrabble, Pictionary, Trivial Pursuit, Chess, poker chips). toilet, shower, Steam shower with heated tile floors. Each of our vacation homes feature our Cobblestone Creek signature plush Egyptian cotton towels, robes and bath mats. Each bathroom has a selection of our exclusive Cobblestone Creek bath spa products, plush toilet paper and facial Kleenex tissue for your enjoyment during your stay. No guest access to the communal pool but Radium Hot Springs pool passes for your families enjoyment of our mineral pools. We booked the chalet for a family vacation. We were very pleased with the cabin and the kitchen was well stocked with everything that you would need. We had trouble with the coffee pot but it was replaced immediately. The bedrooms were perfect. Would definitely come back again. We booked the chalet for a family/friend ski trip over New Years. It was a good sized cabin, and CobbleStone Creek had everything we would need & more. The kitchen was completely full of glassware, utensils & cookware. Very accommodating . There was even tooth brushes in case you had forgotten yours. Everything was very tidy and clean when we arrived. It was nice to have bunk beds for the kids as well. Everything was great minus there was no hot tub :( That would be a nice touch to an already fantastic cabin. CobbleStone was great and even let us order a PPV event (UFC). Made for a fun evening! Overall it was very relaxing and peaceful and would recommend this place to anyone. We had a fantastic stay at this lovely Chalet with our friends. This was a cozy place that was clean and comfy. Thank you for helping make our vacation great! Well equipped chalet, including comfortable outdoor furniture, beautiful views, quiet surroundings,lovely linens and towels. Steam shower was wonderful! Excellent layout for Grandparents downstairs, and the "Kids" upstairs. Had great weather, so even got to use the supplied beach towels..nice touch. Did have some hiccups with the internet; if a working holiday, might have been a problem. Saw 4 bears, 40 mountain sheep, 2 eagles, numerous deer, and a wolf! Overall, a wonderful family vacation. This cabin was great to host myself and my 8 employees! Earlier that day we went to Golden for a snowmobiling trip and then ventured to Radium to stay over night. Booking was made very easy through Rebecca and she was very accommodating! Would stay again! Payment Terms: A deposit of one nights rent plus the cleaning fee and taxes would be required upon reserving your dates and the balance 30 days (55 days over Christmas and New Year's) prior to your arrival date. If your reservation is within 30 days (55 days over Christmas and New Year's) of your arrival date, the full amount would be due at the time of booking. Visit http://www.cobblestonecreek.ca/booking_policy.php for our booking and cancellation policies. Our stay for 3 nights and only pay for 2 nights special is valid from January 20th to April 30th, 2017 not including long weekends or holiday periods. 3 night minimum stay over all long weekends and 4 nights over Christmas and New Year's holidays. Please check the currency box for the country you are in (top right of rate table) as depending on where you are the rate may show in your local currency, i.e. US dollars / GB pounds or just US dollars, etc. VRBO has incorrectly put the currency of our chalet in US dollars even though we have asked them to correct this, they have not. We do only process rental payments in Canadian dollars, no exception. Please therefore ensure the Currency Drop down at the top right of the rate table is set to "CAD" to reflect the rate that we will charge. Thank you in advance, we look forward to your stay in our chalet!